Here is the formula—my daily practice with the dancing stars: The signs of the zodiac are seasons. Seasons tell stories that offer illumination, from basic guidance about planting and harvesting to spiritual guidance about our souls’ growth, death, and rebirth. Astrology’s genius, in my opinion, is how it tells the necessary story of the moment, the story that matters right now. I believe the seasonal story that matters right now is about consecration. The online etymological dictionary says the word consecration comes from two words: secration, which means “making sacred” and com, which means “together”. Together. Making sacred. We need consecration right now because we seem to be on the verge of nothing making sense anymore, when children’s bodies are washed up on beaches, when land and water are desecrated for cheap oil, when Black bodies are deemed less valuable than White bodies. This desecration needs a remedy. We need to make sacred together. We need consecration. 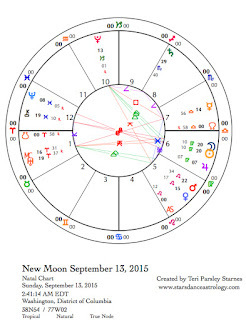 The New Moon this week on September 13 is also a Solar Eclipse, and so, the story gets more interesting and more vital. Occurring near the end of Virgo, the next lunar cycle is an opportunity to erase old patterns (Sun’s light eclipsed) and create new ones (Sun’s light returns) about the temples we are building. What structures will help us reconsecrate life? By the Full Moon (a Super Moon Lunar Eclipse) on September 27, the Sun will be in Libra. The opportunity: to erase old patterns of partnership and create new ones for the vital story of now. Together, we may honor the dishonored and restore right relationship to the sacred. May this be the season of Consecration. Monday, September 7. Labor Day. It takes many hands to create a firm foundation. The Cancer (cardinal water) Moon emphasizes the essentials of life, like having a home to shelter and food to nourish us. On this Labor Day, we may remember that through collective efforts we can make these essentials available to all. Mercury in Libra (cardinal air) is getting more verbal about injustice as it forms a t-square with the Moon and Pluto in Capricorn (cardinal earth). This square between Mercury and Pluto builds this week. Under this aspect, it is hard to keep quiet. With a Libra emphasis, however, we may feel inhibited about rocking the boat. Invoke grace as you speak your truth. The aspect between Mars in Leo (fixed fire) and Chiron (mutable water) adds to the hesitancy of the day. The opportunity is to blend passion with compassion. September 8—Balsamic Moon: Surrendering. There is so much important work to be done right now, what could this phase of surrendering be about? Certainly not giving up, I hope. Sometimes the work is so overwhelming that we may want to give up. What if we surrender whatever despair is arising? Under the spell of this Virgo (mutable earth) lunar cycle, you may be feeling the gloomof overwhelming odds. Virgo’s demon says: You must be perfect. Virgo’s genius says: The work itself is enough. Embrace your Virgo genius. Relish the work and leave the outcome to the gods. This type of attitude adjustment helps us to run with the fiery energy of action today. Mars in Leo (fixed fire) is trine to Uranus in Aries (cardinal fire). We are inpatient, but motivated to make change happen. Remember that fires need to be fed too. Feed your passions. There is pause this evening when the Moon in Cancer (cardinal water) makes a trine to responsible Saturn in Scorpio (fixed water). We may be feeling momentarily reflective before the Moon joins Mars in Leo tonight encouraging more expression. Wednesday, September 9. Mercury in Libra (cardinal air) is preparing to turn retrograde on September 17. Today, Mercury makes the first of three squares to Pluto in Capricorn (cardinal earth). This is perhaps the signature energy of this whole Mercury retrograde period, which finally resolves on October 22 at the third Mercury/Pluto square. Pay attention to communication issues. There will be strong desire to speak for justice in the face of toxic power. From a longing for effective communication, we learn the Libra gifts of diplomacy and balance. With the Moon, Venus, and Mars still in Leo (fixed fire) under the waning phase of this lunar cycle, we reflect on self-love and pride. Let your flame be fed. Thursday, September 10. Early risers alert! Before dawn in the eastern sky, look for Venus, the waning crescent Moon, and Mars together. Think of this as the Moon making her final blessing on the passage of Venus and Mars through Leo (fixed fire) over the last few weeks. Venus has recently stationed direct and will actually join Mars one more time in November in the sign of Virgo (mutable earth). But now, the Leo story takes center stage. My spiritual tradition teaches the technique of finding our right size, neither too self-effacing nor too self-important. If each of us burns with the right-sized flame, we have access to joy, generosity, and love. Celebrate your bright nature. Friday, September 11. The real countdown to the next New Moon (also a Solar Eclipse) begins today. For the next two days under the dark Moon, begin to shed old patterns. The metaphor I am using for this Virgo season is about building my temple. This temple is a place to restore my dedication to sacred relationship with life and to re-center my body, mind, and spirit in wholeness. Consider your temple. What feels stale or encumbered by unrealistic expectations? What work is finished? Are there altars within that need tending? Channels are opening wide. The Moon contacts Jupiter in Virgo (mutable earth) and opposes Neptune in Pisces (mutable water). Separation between the mundane and the numinous blurs. Saturday, September 12. See yesterday’s forecast for continuity about building your Virgo temple. Today, we get to forgive ourselves. This is essential Virgo (mutable earth) work. We are preparing ourselves for the New Moon Solar Eclipse tomorrow in Virgo. The metaphor for an eclipse is rebooting a computer. We reset the systems by turning everything off. In the preparatory darkness, what system no longer works for you? Have you been holding on to shame or despair? Consider yourself forgiven. The Sun in Virgo opposes Chiron in Pisces (mutable water). Chiron, the Wounded Healer, says place those wounds on the altar. Believe that even our wounds are sacred. The Sun is quincunx Uranus in Aries (cardinal fire). Small steps are incredibly effective in bringing about change, even if you don’t believe it. September 13—New Moon: Dreaming. Solar Eclipse. In this week’s introduction I wrote about consecration. The roots of the word mean to make sacred together. The dedication for this lunar cycle is that we may learn to make sacred again our connections to the living world by working together to heal our desecrations. Recently, I have been exploring the edges between signs. Each lunar cycle intention is colored by a new edge. This month, the edge is the one between Virgo (mutable earth) and Libra (cardinal air). In Virgo, we build the temple; in Libra we work together in partnerships to consecrate the sacred places. Partnerships take all forms. Person to person. Person to animal. Tree to owl. Cloud to lake. The forms and relationships are endless. Take in the sacred relationships around you. The goal is to re-consecrate the Temple and our right relationship to all beings. Solar eclipses are unpredictable yet they provide an opportunity to work consciously with the idea of starting anew. With Virgo’s attention on purification, we can let this pause in the normal transmission of life to be a purifying moment. The key is to purify from a joyful rather than shame-based place. Purification can be fun. 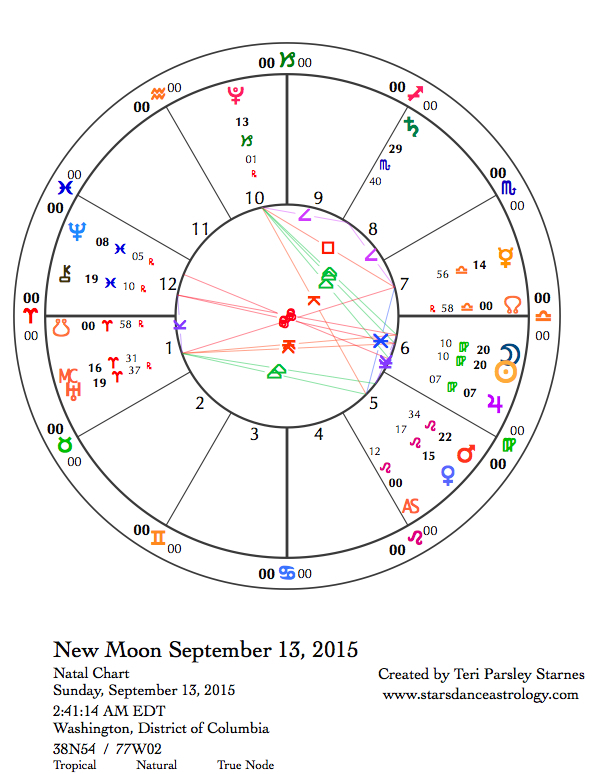 In the chart for the New Moon, Jupiter in Virgo is opposite Neptune in Pisces (mutable water). Chakra channels are open to receive vision. Oppositions are invitation to integrate and balance. The balance of Virgo and Pisces grounds our transcendent aspirations into pragmatic action and elevates our mundane lives into sacred realms. Venus is now moving direct in Leo (fixed fire). Self-conscious doubt and insecurities may fall away. The trine between Venus and Uranus in Aries (cardinal fire) encourages bold actions of self-love. The square between Mercury in Libra (cardinal air) and Pluto in Capricorn (cardinal earth) puts enough tension in the air that we just have to say something. Mercury will be beginning a retrograde period through Libra on September 17. Diplomacy comes in handy as we navigate tricky communication issues.